Guess what I picked up yesterday at the Bernardston Farmers Supply? A dozen day old Ameraucana chicks. So cute - aren't they? Here's a video I took of them chirping away. Make sure you have the volume up. 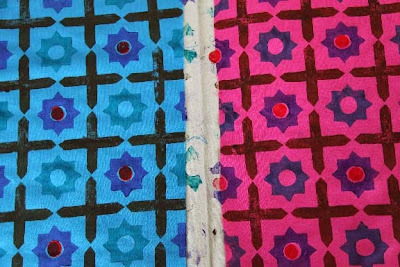 Just a heads-up that last night I added a second Fabric Printing Class to the "Getting Stitched On The Farm" class schedule. The dates are July 18 and 19. This class is limited to 6 students. 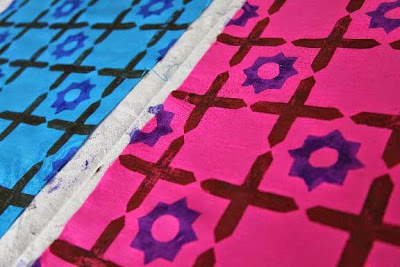 It is a very personal class where I help you learn to design your very own fabric. Read about the first session HERE and HERE. Sign up via my website here. There are 5 spaces available as of this morning. 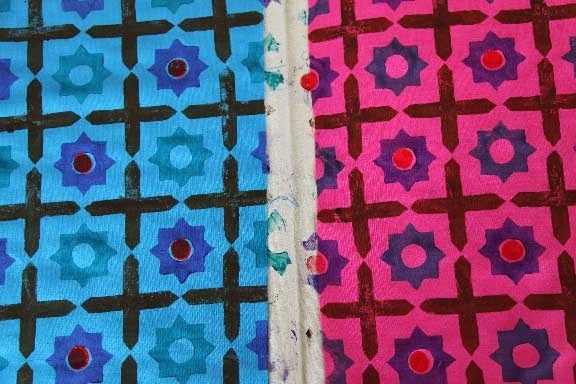 Below are a couple photos of a recent in process Fabric Printing Project that I did. This weekend is the annual Massachusetts Sheep and Woolcraft Fair in Cummington, MA. Saturday and Sunday. Check it out here. It is a great family friendly event with sheep shows, fiber, Border Collie Herding demos, angora rabbits and lots of gorgeous textile related things to buy. About 2 hours from Boston. The Farmer will be selling our lamb at the Amherst Farmers Market on the Common from 8 to 2 tomorrow - Saturday. 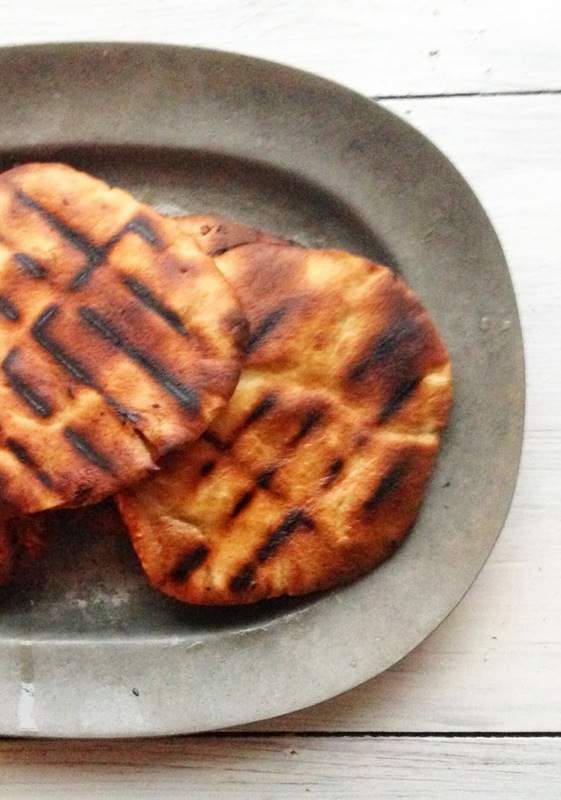 Pick up some ground lamb and try out this recipe for Grilled Pitas Stuffed with Spiced Lamb. It's an interesting recipe and although it sounds like it will not work, it does. It would be a nice appetizer too - cut into wedges. This morning, some of the sheep escaped their fencing. I took this little video of them munching away on the weeds and grass. Listen to them munch and to the birds singing. There is a frost warning for tonight. If you live in New England, the traditional time to plant a garden is Memorial Day. I'm not quite ready yet but soon. For the time being, I can share the grass with the sheep. Hope all of you have a glorious Memorial Day Weekend if you live in the States. HAPPY M-DAY to you too! And of course, I'll be doing a table at a church CRAFT & [frozen]-"PLANT" SHOW tomorrow! - Then again, perhaps these temps might actually help with my BLANKET sales..? hmm.. I wasn't planning on it, but I think I'm bring some of my TOQUES and cotton SCARVES along as well. JUST in case! It was down in the 40s here last night. I am in southern Oklahoma. I had to get the blankies back out. That's okay though. The atmosphere is supersaturated and unstable. Heat means severe weather and those dreaded twisty winds and baseball sized hail. I am happy to be chilly! We have suddenly begun to green up here and it is so lovely to hear the birds Sing. Have a lovely Memorial day.